The next generation Early 2015 Silver Macbook ushers in a new age in portable computing! At just 2.03 pounds and half an inch thick, the refurbished Early 2015 Macbook is the Mac laptop you want to take with you when size and weight are critical. But Apple didnt just design a light Mac laptop, they packed it with advanced features that make the discount Early 2015 Silver Macbook the future of computing. It has a high resolution Retina screen, advanced Butterfly keyboard, Force Touch trackpad and ultra-efficient Intel Core M processor. 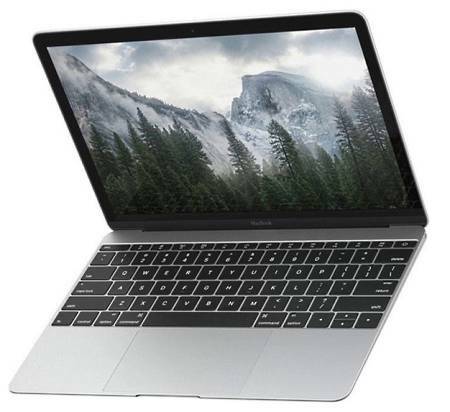 The affordable refurbished Early 2015 Silver Macbook is light in your hands and light on your budget at GainSavers everyday discount prices. Everything about the refurbished Early 2015 Silver Macbook is designed to make it as thin and light as it could possibly be. At only 2.03 pounds, youll hardly notice youre carrying it with you. Even more amazing is how thin it really is. The used Early 2015 Silver Macbook is only 0.52 inches at the widest end and tapers down to just 0.14 inches on the edge where the enclosure opens. The width and depth of the refurbished Early 2015 Silver Macbook are just 11.04 inches x 7.74 inches, which is smaller than a standard sheet of paper. The cheap used Early 2015 Macbook will easily fit in any bag or briefcase and wont weigh you down. The fast, efficient processor built into the refurbished Silver Macbook is the Intel Core M processor. The fifth generation Intel Core M is designed to use as little battery power as possible. And it runs at such a low temperature that it eliminate the need for an internal fan. At the same time, the Intel Core M processor running at 1.1GHz has all the performance you need, from managing your college classes to running a small business. The incredible high resolution 12-inch Retina display on the cheap Early 2015 Silver Macbook is truly breathtaking. The screen resolution of 2304 x 1440 is much higher than plain old HDTV resolution of 1920 x 1090. The used 12-inch Silver Macbook delivers a rich, detailed image youll enjoy for watching videos and playing games, or getting down to work with multiple applications and a lot of open document windows. The refurbished Early 2015 Silver Macbook Retina display lets you play harder and get more accomplished. The Retina display on the used Early 2015 Macbook also offers vivid brightness and sharp contrast. Thats a result of its redesigned pixels with 30% larger apertures to allow more light to come through the backlit screen. Even better, the larger pixel aperture delivers more light without requiring additional power from the battery. Both the Mac and PC world are turning to the new USB-C standard for connecting power and peripherals. And the Early 2015 Silver Macbook has one. Using the USB-C port you can connect your used Silver 12-inch Macbook to a power adapter, your peripherals or an external display. The USB-C port is much smaller than the earlier USB port, but it provides up to 5 Gbps of high speed data transfer. One additional feature youll find handy is that the USB-C cable is reversible, so you can connect either end to your used discount Early 2015 Macbook and it still works fine. The affordable Early 2015 Macbook uses the 802.11ac wireless networking standard that is three times faster than the previous 802.11n standard. This is great news for Mac laptop users who are always online using Wi-Fi. With the fast Intel Core M processor and the improved Wi-Fi speeds in the used Early 2015 Silver Macbook, your web pages, videos and file downloads will fly. And online gaming is a brand new experience with a high speed 802.11ac Wi-Fi connection. Before you check out, dont forget to go through the Configurator menus to customize your used Early 2015 Silver Macbook. You can upgrade the flash drive to 256GB and boost the memory up to 8GB. You can also have GainSaver technicians install Microsoft Windows on your cheap used Early 2015 Macbook. Having both macOS and Windows on your discount 12-inch Macbook gives you two computers in one that can run any applications designed for either Mac or PC. When finished with the customization, click the Buy Now button to continue checking out.